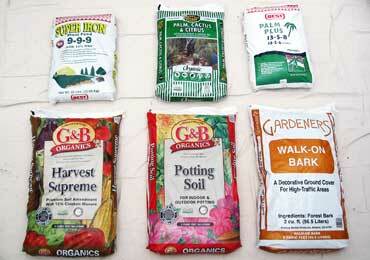 The groupings below represent some of the categories of plants and dry goods available at Seaside Growers Nursery. Some images link to other pages. 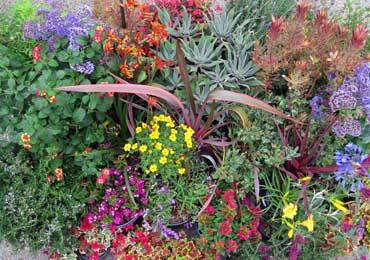 With the California drought Seaside Growers has vastly increased the inventory of xerophytic water saving plants. These water savers may have fleshy colorful leaves or have spiny leaves or no leaves at all. Succulents are the new trend in water thrifty landscaping an﻿d for compliance with the water restrictions and replanting lawn areas. Available sizes: 4" pots to 24" box. Seaside Growers Nursery carries a nice assortment of general landscape shrubs, trees and vines for landscapes and patios. 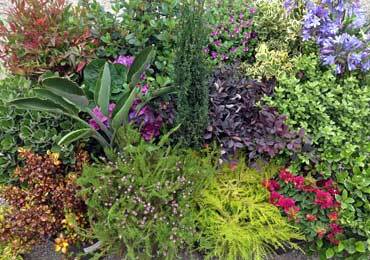 Most of the general ornamentals can survive with a weekly watering once established. Some varieties include: Agapanthus, Anigozanthos, Bougainvillea, Calliandra, Cinnamomum, Coleonema, Coprosma, Cordyline, Cupressus, Gardenia, Hydrangea, Jasminum, Magnolia, Maytenus, Nandina, Pandorea, Phormium, Polygala, Schinus and Stephanotis. One of the most common requests is for screening plants. 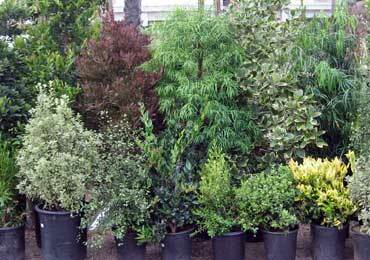 Come see our fine assortment of tall or short hedge and screening plants in 5 and 15 gallon sizes. Larger sizes and quantities are available. Some include: Buxus (Boxwood), Cupressus sempervirens compacta aka Tiny Towers, Dodonea viscosa 'Purpurea'(Purple Hopseed), Elaeocarpus decipiens (Japanese Blueberry), Laurus nobilis (Bay Laurel), Ligustrum texanum (Privet), Pittosporum 'Silver Sheen', Pittosporum tenuifolium, Podocarpus gracilior (Fern Pine), Podocarpus henkelii, Podocarpus macrophyllus, Prunus carolina (Carolina Cherry) and others. Seaside Growers Nursery has plants that are true grasses as well as plants that present a grassy appearance. True grasses such as Pennisetum respond to an annual cutting nearly to the ground prior to Spring, whereas the other grass-like plants need only leaf maintenance. Some members of the Cordyline family can be bushier, similar to the Phormium (flax) while others are more upright. 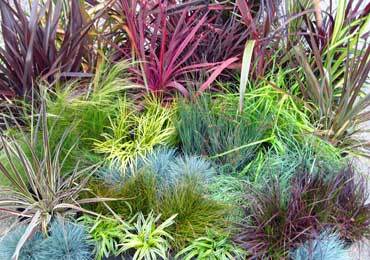 Some varieties include: Acorus, Carex, Chondropetalum, Cyperus, Dianella, Equisetum, Festuca, Helictotrichon, Juncus, Liriope, Lomandra, Melinus, Miscanthus, Mulenbergia, Nassella, Ophiopogon, Pennisetum, Phormium, Sesleria, and Stipa. Bamboo is available in clumping or running varieties. 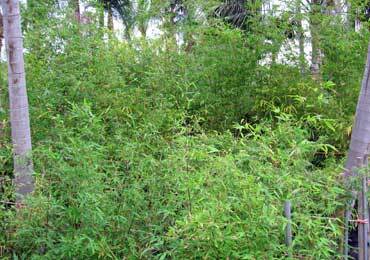 The Clumping type bamboos do not require a root barrier for containment in the garden. Running bamboos are great for containers. Come view our bamboo plants and the selection guide at the nursery. Sizes are 5 and 15 gallon. 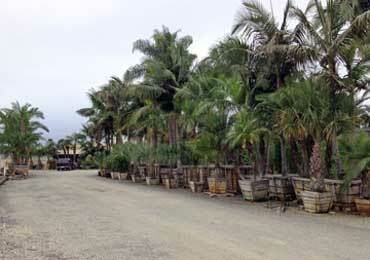 Palm Trees and the ancient Cycads are well represented at Seaside Growers Nursery. 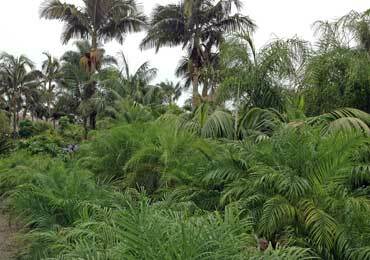 Palm and Cycad photos with lists of plant names generally in stock are a click away. The nursery at first glance has a very tropical flavor, and rightly so. 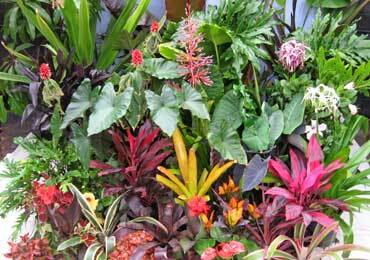 Tropical looking gardens are a specialty at Seaside Growers. 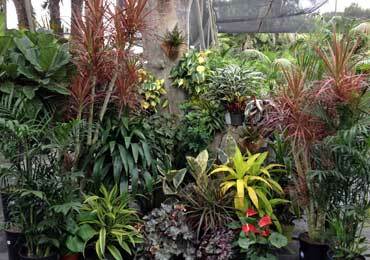 Landscape bromeliads for sun or shade are also available. Some tropicals include: Alocasia, Alpinia, Anthurium, Aspidistra, Aucuba, Begonia, Canna, Clivia, Colocasia, Cordyline fruticosa, Costus barbatus, Dracena, Fasthedera, Heliconia, Hibiscus, Monstera deliciosa, Philiodendron, Plumeria, Ravanella madagascariensis, Schefflera, Schizolobium and Strelitzia. 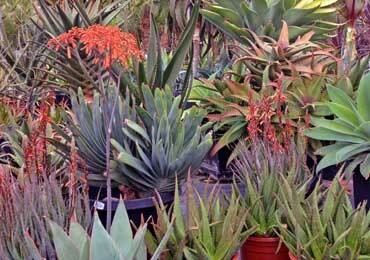 Bromeliads: Achmea, Ananas, Bilbergia, Dyckia, Fascicularia, Neoregelia, Portea and Vriesea. 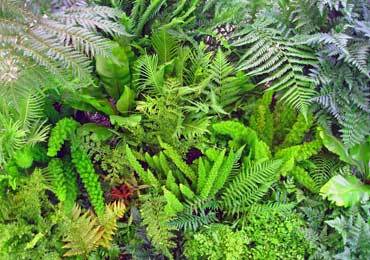 Ferns and fern-like plants are great for softening the shade garden while adding to the design with different leaf shapes and green leaf color variations. Tree ferns can add dramatic height and provide some shade for under planting. Water wise Asparagus Foxtail Ferns, while not actually ferns, are great for sun or shade and are included with the ferns. Some varieties include: Adiantum (Maidenhair Fern), Asparagus, Asplenium bulbiferum (Mother Fern), Asplenium nidus (Bird's Nest Fern), Blechnum (Silver Lady Fern), Cyathea (Australian Tree Fern), Cyrtomium (Holly Fern), Davallia (Rabbit's Foot Fern), Dicksonia (New Zealand Tree Fern), Dryoptens (Autumn Fern), Microlepia (Lace Fern), Pteris, Rumohra (Leather Fern), Woodwardia (Giant Chain Fern) and others. Come view our large shade house loaded with plants for the home or office interior or shady garden locations. A few choices are: Aspidistra, Aucuba, Croton, Dracena Varieties, Ficus benjamina (Weeping Fig), Ferns, Ficus lyrata (Fiddle-Leaf Fig), Pachira aquatica (Money Tree), Palms assorted, Philiodendron varieties, Pleomele 'Song of India', Sanseveria, Schefflera amate, and many others.